St. Joseph High School is a voluntary member of the Southwestern Michigan Athletic Conference. The value of membership in this conference is the aid it renders in the arranging of schedules, equalizing competition, conducting league championships, and generally upgrading the program of member schools through the establishment of conference standards and goals. Membership in this conference provides high schools the opportunity for local competition without excess travel, and aids in inter-school relationships and the promoting of good sportsmanship. 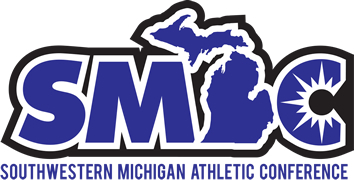 The Southwestern Michigan Athletic Conference originated in 1931 and is now commonly known as the Big Sixteen. Charter member schools were St. Joseph, Niles, Three Rivers, Dowagiac, and South Haven. St. Joseph tendered its resignation in 1938 and made a re-appearance in 1940. The membership has varied since then. Accordingly, the historians make reference to the conference by its adopted name, but at times refer to it also as the Big Five, Big Six, Big Eight, or Big Sixteen as the number of teams indicates. The league for 2014 has dropped the "Big", choosing to remain as the Southwestern Michigan Athletic Conference going forward, no matter the number of members. 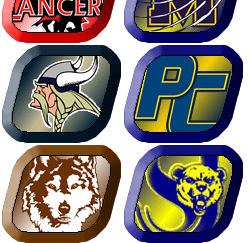 The Southwestern Michigan Athletic Conference expanded from eight teams to 16 teams in the 2001-02 school year. The original eight teams are; Battle Creek Central, Benton Harbor, Kalamazoo Central, Kalamazoo Loy Norrix, Niles, Portage Central, Portage Northern, and St. Joseph. When the league expanded in 2001, eight teams were added. 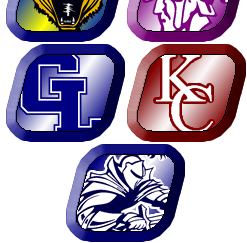 Those teams are Battle Creek Harper Creek, Battle Creek Lakeview, Coldwater, Marshall, and Sturgis, who joined from the now disbanded Twin Valley Conference. Dowagiac and Lakeshore were added, both independent teams who were former members of the Lakeland Conference. Finally, Mattawan joined after being a member of the Kalamazoo Valley Association. Prior to the start of the 2006 school year, Dowagiac left the league and joined the Wolverine Conference. To fill the void, the conference welcomed Jackson Lumen Christi as a member for football only. In 2011 Richland Gull Lake joined for all sports except football, and fully joined for football in 2012. When the conference expanded in 2001, the league was divided into 3 divisions with the East and West division having five teams and the Central Division having six. In the largest expansion in league history eight new teams were added, bringing the total from eight to sixteen. After Dowagiac's departure, Jackson Lumen Christi took their place for a season until a new football schedule rotation was started. In 2007, Jackson Lumen Christi was placed in the East Division to align with the locations of the other schools. Mattawan moved to the West Division for football, all other sports moved to the West a year earlier. For the 2011 season, the Big 16 eliminated the Central Division in all sports (football was done in 2009), due to the addition of Gull Lake for all sports except football. Kalamazoo Central and Kalamazoo Loy Norrix will be switching divisions partly because of Gull Lake's addition. For 2012, Jackson Lumen Christi rejoins the CAAC (Capital Area Activities Conference), while Gull Lake is in the Big 16 full time. Benton Harbor left the SMAC voluntarily after the 2015-16 season, leaving the SMAC with 11 schools for the 2016-17 season. Mattawan will move to the West Divsion in 2018 after a league realignment.